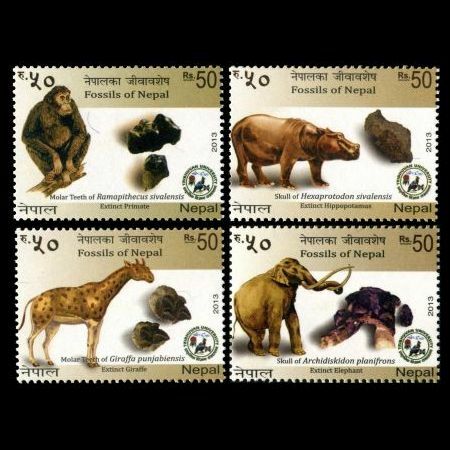 Nepal 2013 "Fossils of Nepal"
On December 31, 2013 Post Authority of Nepal issued a set of 4 stamps (actually these stamps are declared on this day, but arrived post office of Nepal much later, in Spring 2014, even though FDC is canceled with post mark dated 31.12.2013 ) shows some fossils and reconstructions of prehistoric animals who leaved on a territory of the country in the past. 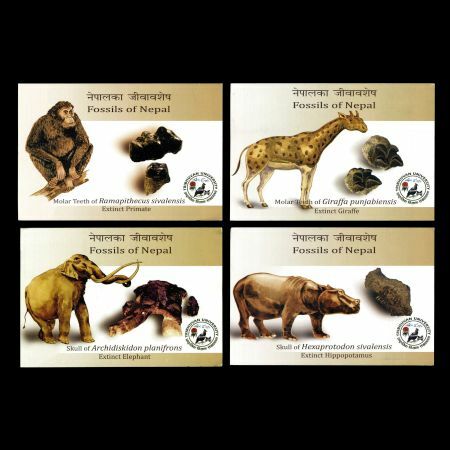 Fossils of these animals found in various areas of Nepal and are in collection of Natural History Museum (NHM). 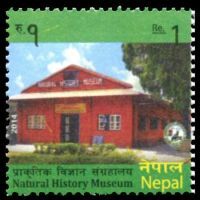 Dr. Ramesh Shrestha, Chief, Natural History Museum, Nepal worked closely with stamp designer and Nepal's post authority to create this stamps. 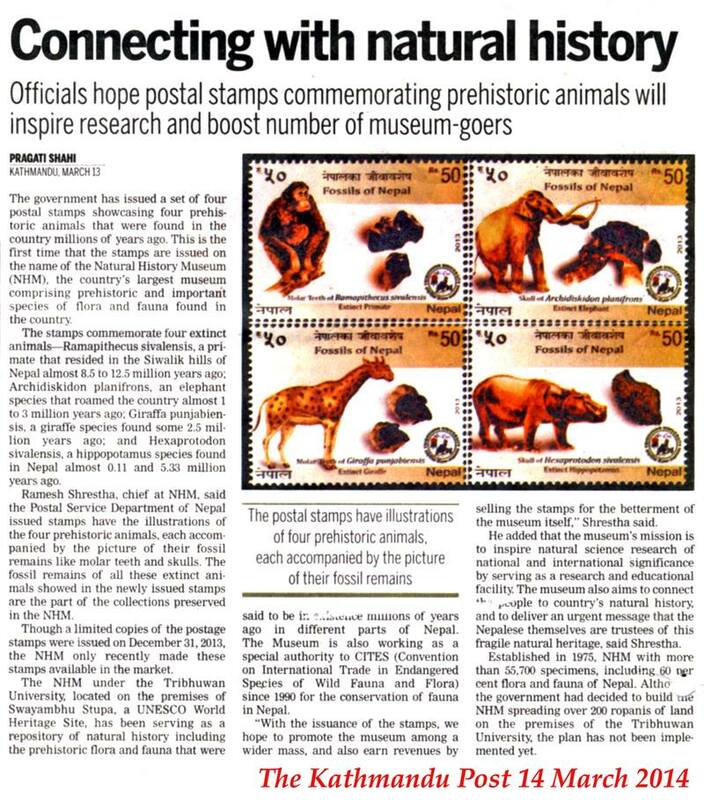 Theis is the first time, collection of NHM is appears on stamps. inspire natural science research of national/international significance; to serve a research and educational facilities with timely environmental information relating natural history to present-day environmental and cultural issues for both Nepali and foreign researchers; to connect the Nepali people with their own country's natural history, and to deliver an urgent message that the Nepalese themselves are trustees of this fragile natural heritage; to promote understanding of the evolution and diversity of flora and fauna of Nepal. The museum was established in 1975. 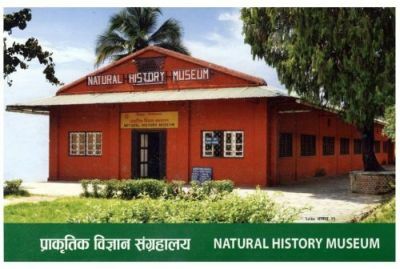 Since then the museum has collected 50,000 specimens of Nepal’s modern and prehistoric flora and fauna. The museum also some relics from the country's prehistoric times. 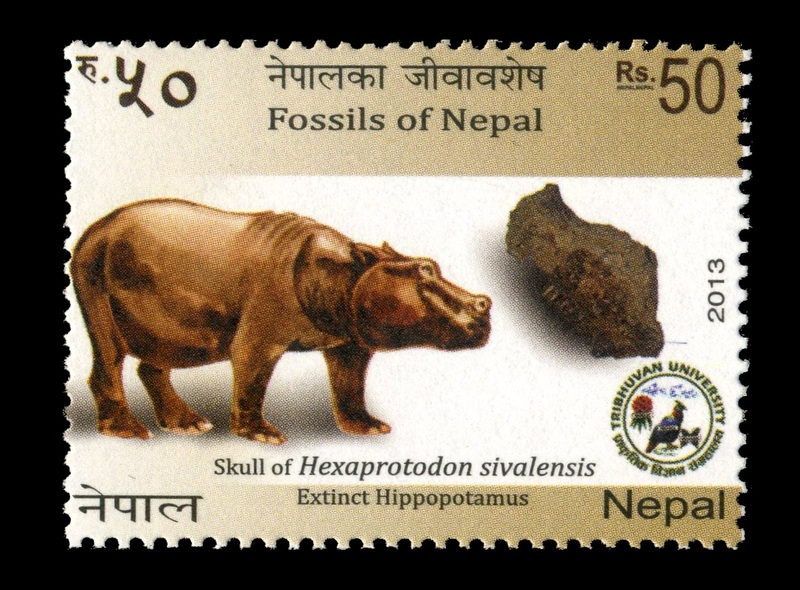 There is a fossilized skull of the Archidiskodon, a species of elephant that roamed the Sivalik Hills Sivalik Hills of Nepal. Another ancient specimen is the molar teeth of Sivapithecus, a hominoid. The skull and the teeth are believed to be around 3 million years and 8-10 million years old respectively. 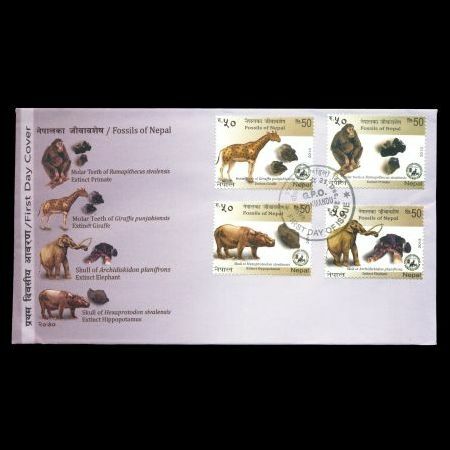 Fossils of all animals are depicted on stamps bellow are from collection of the museum. Giraffa punjabiensis (Extinct Giraffe): The genus of Graffids evolved from a group of even toed ungulates in the early Miocene almost 25 million years ago. The extinct Giraffa punjsbiensis inhabited large parts of Eurasia including the ancient land of Nepal and eventually spread into Africa. Fossil records indicate many other giraffids thrived between the Miocene era (around 20 million years ago) and the recent past. They formed part of a relatively late mammal diversification that also produced cattle, antelopes, and deer following a climate change that transformed subtropical woodlands into open savannah grasslands. The descendents of the Giraffa punjsbiensis species form parts of a relatively late mammal diversification that also produced cattle, antelopes, and deer following a climate change that transformed subtropical woodlands into open ruminant artiodactyls mammals that share a common ancestor with deer and bovid. The biological family, once a diverse group spread throughout Eurasia and Africa, contains only two living members, the giraffe and the okapi. 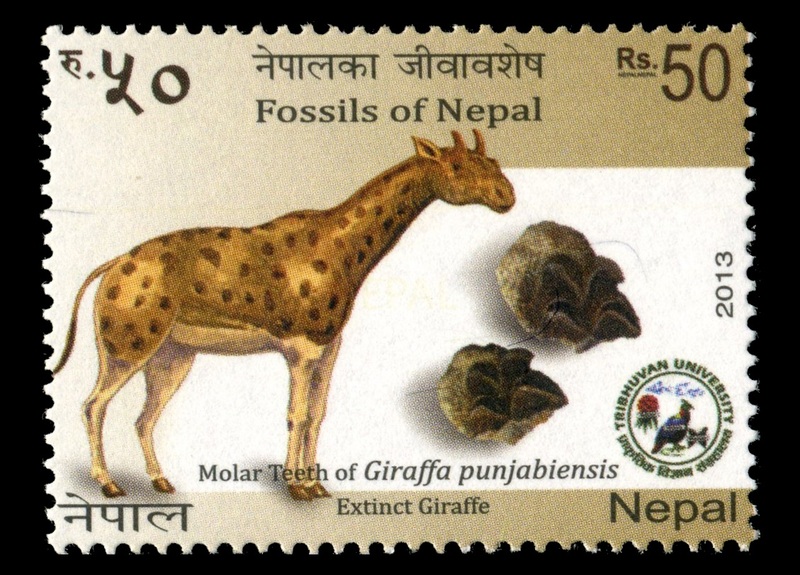 The molar teeth of this extinct Giraffe were found on the banks of Surai khola in Nepal. 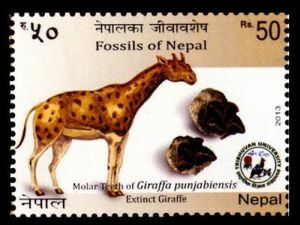 The present stamp shows the image of Giraffa punjsbiensis and the its molar teeth. 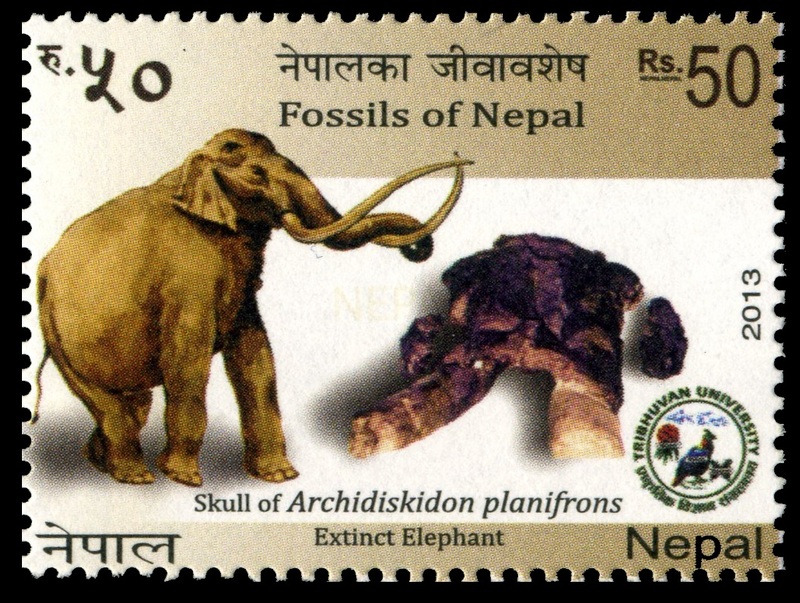 Archidiskidon planifrons (Extinct Elephant); Archidiskidon planifrons is a type of a genus Stegodon of the extinct subfamily Stegodontinae of the order Proboscidea. While tracing the biogeography of these animals they were found to live in large parts of Asia during the Pleistocene, Pliocene and the Holocene epochs. 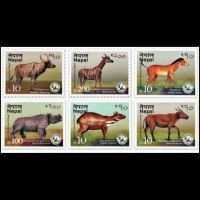 Interestingly, these animals were also found in the then ancient lands of present day Nepal. Like their modern relatives, Archidiskidon were quite large. The largest known species reached height in the region of 4m. at the shoulder and weighed up to 8 tones, while exceptionally large males may have exceeded 12 tones. However, most species of Archidiskidon were only about as large as a modern Asia elephant (which are about 2.5m to 3m high at the shoulder). Both sexes of Archidiskidon bore tusks. A definitive explanation for their extinction has yet to be agreed upon. The warming trend (Holocene) that occurred 12,000 years ago could have contributed to their process of extinction. Many forests replaced open woodlands and grasslands also, which contributed in the reduction of their habitats. 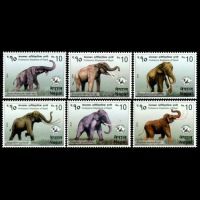 Many fossilized body parts of these elephants were recorded from different parts of our country. There is a fossilized skull of the Archidiskidon (3 million years) found on the banks of Rato Khola in the collection of Natural History Museum. 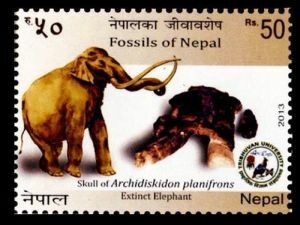 The present stamp shows the image of Archidiskidon planifrons and the completed skull with its tusks. Ramapithecus sivalensis (Extinct Primate): Ramapithecus sivalensis (Synonym= Sivapithecus punjsbiensis) is a species of an extinct primate. 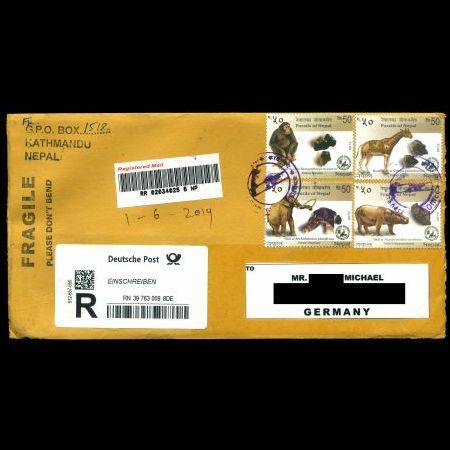 Fossil remains of this animal, dated from 12.5 million to 8.5 million years old in the Miocene, have been found in the Siwalik Hills of Nepal and other adjoining areas. 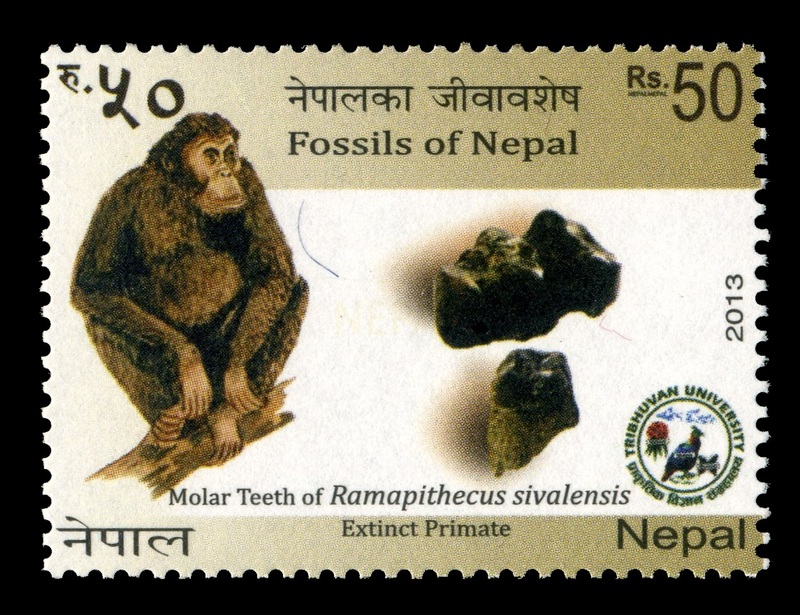 The molar teeth of the ancient hominoid, Ramapithecus (around 9.0 – 9.5 million years old), was discovered in Tinau Khola on way to Tansen from Butawal in 1932 by G. Edward Lewis. The finding has been a great landmark to know about the distribution of Late Miocene hominoids in south Asia. During that time it was claimed that the jaw was more like a human jaw. Ramapithecus was understood to have direct ancestral roots to modern humans. Meanwhile, more complete specimens of Ramapithecus were found in 1975 and 1976, which showed that it was less human-like than had been thought before. It began to look more and more like better Sivapithecus instead of Ramapithecus. The analysis of the original Ramapithecus fossils had errors directing them as ancestors of modern humans. 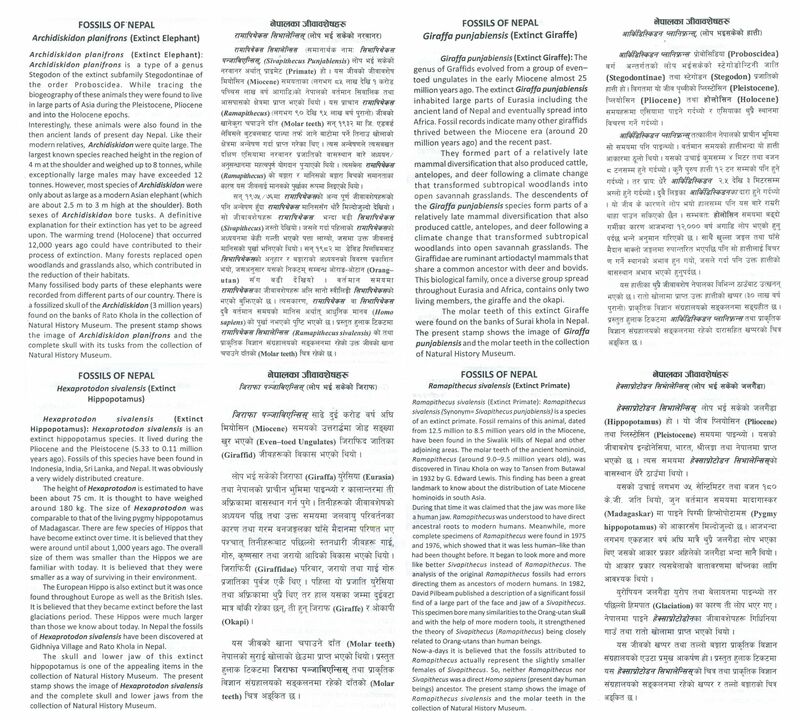 In 1982, David Pilbeam published a description of a significant fossil find if a large part of the face and jaw of Sivapithecus. This specimen bore many similarities to the Orang-utan skull and with the help of more modern tools, it strengthened the theory of Sivapithecus (Ramapithecus) being closely related to Orang-utan than human beings. Now-a-days it is believed that the fossils attributed to Ramapithecus actually represent the slightly smaller females of Sivapithecus. So, neither Ramapithecus nor Sivapithecus was direct Homo sapiens (present day human beings) ancestor. 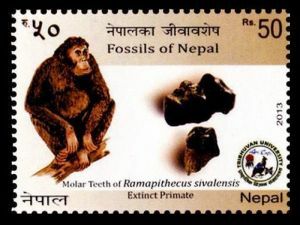 The present stamp shows the image of Ramapithecus sivalensis and the molar its teeth . Hexaprotodon sivalensis (Extinct Hippopotamus): Hexaprotodon sivalensis is an extinct hippopotamus species. It lived during the Pliocene and the Pleistocene (5.33 to 0.11 million years ago). Fossils of this species have been found in Indonesia, India, Sir Lanka, and Nepal. It was obviously a very widely distributed creature. The height of Hexaprotodon is estimated to have been about 75 cm. it is thought to have weight around 180 kg. The size of Hexaprotodon was comparable to that of the living pygmy hippopotamus of Madagascar. There are few species of Hippos that have become extinct over time. It is believed that they were around until about 1,000 years ago. The overall size of them was smaller than the Hippos we are familiar with today. It is believed that they were smaller as a way of surviving in their environment. The European Hippo is also extinct but it was once found throughout Europe as well as the British Isles. It is believed that they became extinct before the last glaciations period. These Hippos were much larger than those we know about today. 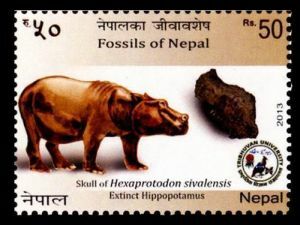 In Nepal the fossils of Hexaprotodon sivalensis have been discovered at Gidniya Village and Rato Khola in Nepal. The skull and lower jaw of this extinct hippopotamus is one of the appealing items in the collection of Natural History Museum. 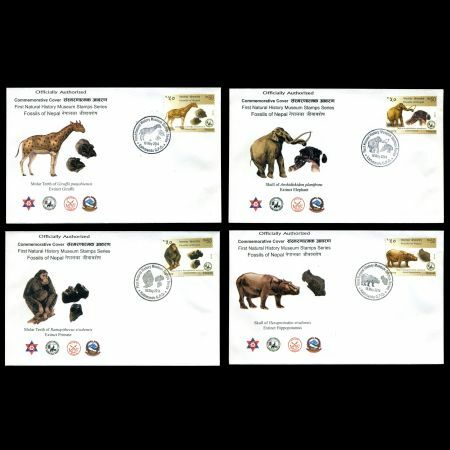 The present stamp shows the image of Hexaprotodon sivalensis and the complete skull and lower jaws. Acknowledgement: Many thanks to Mr. Shankar Shrestha and Mr. Dr. Ramesh Shrestha for their support.